I've been listening all day to the idiotic comments on the appointment of Steve Bannon as Trump's campaign manager. They describe Bannon as a wild bomb thrower running the racist Breitbart news site. This is absolutely hilarious. Former Breitbart editor Peter Schweizer originally asked me in 2010 to start cross-posting my World View articles on the Breitbart news site, and later Bannon took over. I know Bannon pretty well, as he's been a big supporter of cross-posting my daily columns on the Breitbart news site, even though I've been highly critical of the rise of xenophobia and nationalism in countries around the world in this generational Crisis era, including Trump's remarks about Mexicans and Muslims. So I know for a fact that Bannon is no bomb thrower, and he's no racist, and for that matter, the Breitbart news site is not racist. I worked pretty intensely with Bannon when I was being filmed for the movie "Generation Zero." 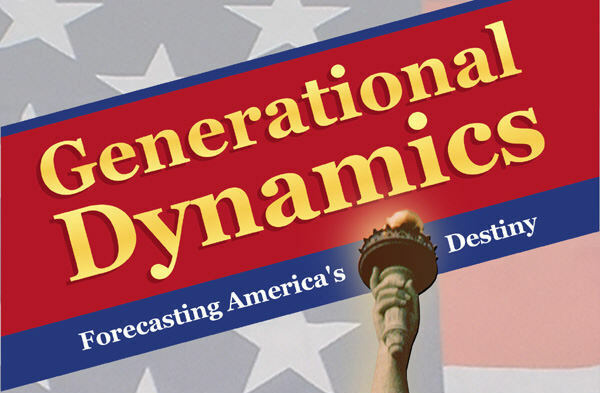 Bannon is one of the few people in the media who have studied what I've written and who understand generational theory and Generational Dynamics. Bannon is also one of the very few people in the media who actually know a great deal about what's going on in the world, a lot more than most politicians do, and certainly a lot more than the media airheads who are writing about him. Bannon is a very bright guy and is someone that Trump needs. Five year old boy, Omran Daqneesh, sitting confused in an ambulance in Aleppo after being pulled from the rubble of one of Bashar al-Assad's airstrikes. To al-Assad, this boy and others like him are just cockroaches to be exterminated. The UN Special Envoy for Syria Staffan de Mistura made probably the strongest condemnations he's ever made about the situation in Syria. Without mentioning Syria's president Bashar al-Assad, he excoriated al-Assad's policies of wanton massacres of innocent civilians. The context was a regular meeting of the international humanitarian taskforce co-chaired by Russia and the United States. De Mistura cut the meeting short after 8 minutes, saying that it made "no sense" to continue, because of the fighting in Syria. "Today we had a very short meeting of the Humanitarian Task Force. It lasted not more than 8 minutes. I decided to use my privilege as Chair to declare that there was no sense in have a humanitarian meeting today unless we got some action on the humanitarian side in Syria. Tomorrow is the World Humanitarian Day and in Syria what we are hearing and seeing is only fighting, offensives, counter-offensives, rockets, barrel bombs, mortars, hellfire cannons, napalm, chlorine, snipers, air strikes, suicide bombers. Not one single convoy has so far reached any of the humanitarian besieged areas this month, not one single convoy, and why? Because one thing, fighting." All of this happened in the context of a heartbreaking video of Omran Daqneesh, a young boy who was pulled out of the rubble and woke up in an ambulance, dazed and covered with mud and blood, a big gash on his face, looking around confused, wondering how he got there. The video has gone viral, and the picture above is a screen shot from the video. 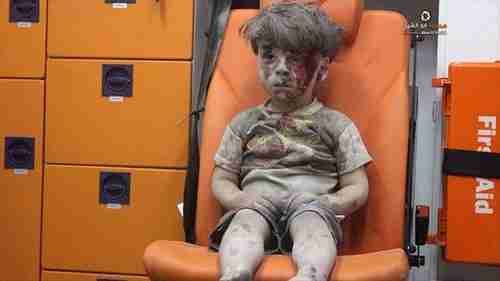 Ironically, Omran is one of the "lucky" little boys, because he survived. De Mistura demanded an agreement for a 48-hour humanitarian pause in the fighting. Later in the day Russia agreed, apparently because of all the international pressure generated by the video of the young boy. But whether Bashar al-Assad will agree is far from clear, and even if does agree, his regime has repeatedly violated previous ceasefires. It's worthwhile to stop and review how we got here. When peaceful anti-government protests began in Syria early in 2011, al-Assad responded with a campaign of torture, massacres and genocide targeted at all Sunni Muslims in Syria, and that genocidal campaign has continued to this day, with full support of Orthodox Christian Russia and Shia Muslim Iran. The 2011 video showed a 13-year-old boy, Hamza al-Khatib, who was beaten and tortured by al-Assad's security forces for over a month, before the boy's swollen and mutilated body was dumped. At that time, people were hoping that the video would shame al-Assad so much that he would stop his genocidal campaign, but of course that never was going to happen. And Hamza al-Khatib was soon forgotten. In 2014, a military photographer who defected from al-Assad revealed 55,000 photos of how al-Assad used electrocution, eye-gouging, strangulation, starvation, and beating on prisoners on a massive "industrial strength" scale. ( "22-Jan-14 World View -- Western leaders sickened by Assad's 'industrial strength' torture in Syria"). Many people hoped that these photos would bring about some changes, and there was even a Congressional investigation. But those photos have also been long forgotten. This is what the Orthodox Christian Vladimir Putin and the Shia Muslim Ayatollah Seyed Ali Khamenei are supporting, and are responsible for. Do not let anyone tell you that there is anything "holy" about either of these men. They both deserve to go to the deepest ring of Hell, along with al-Assad himself. It's almost unbelievable how much destruction al-Assad has caused. Thanks to al-Assad, Putin and Khamenei, there are about 50,000 jihadist fighters from 86 countries that have come to Syria, first to join the rebels fighting al-Assad, then to join the al-Qaeda linked Jabhat al-Nusra (al-Nusra Front, now Jabhat Fateh al-Sham or JFS), and the so-called Islamic State (IS or ISIS or ISIL or Daesh). Al-Assad has created the al-Nusra front and ISIS. He's created millions of refugees that have flooded into neighboring countries, and over a million have poured into Europe. As I like to point out, almost every day something new happens that a few years ago you would have to have been crazy to believe would ever happen. Whether it's in America, Europe, Africa, the Mideast or Asia, things that could never happen are happening. Many of those impossible things have occurred in Syria, and many are related to the laughable peace talks, which have only made things easier for al-Assad and his extermination campaign. Kofi Annan, the virulently anti-American former Secretary-General of the United Nations from Ghana, was the first UN envoy on Syria. Annan formulated a farcical six-point 'peace plan' which said absolutely nothing, but which al-Assad used as a cover to continue exterminating innocent Sunni women and children with impunity. After Kofi Annan was repeatedly humiliated by Bashar al-Assad, the UN appointed a new Syria peace envoy, Lakhdar Brahimi, to replace Kofi Annan. Brahimi wasn't as much of an idiot as Annan was, but he still resigned in disgust in May 2014, after it became clear that al-Assad really had no desire to do anything but exterminate Sunni civilians. So the next UN envoy was and is Staffan de Mistura, and I really can't figure him out. Putin and al-Assad have repeatedly made a fool out of de Mistura and made him look like an idiot, and yet he clings on as UN envoy and makes moronic statements like, "This will not be tolerated." Perhaps the current crisis will be his breaking point. At any rate, this has been going on for over five years, with no end in sight. It looks more and more that the Syrian war will not end until the entire Mideast is engulfed in war.